In an industry where it is predominately male, Kings’ COO Matina Kolokotronis is taking the right steps to make a change for women in the NBA. Editor's note: Matina Kolokotronis is the Chief Operating Officer for the NBA’s Sacramento Kings. 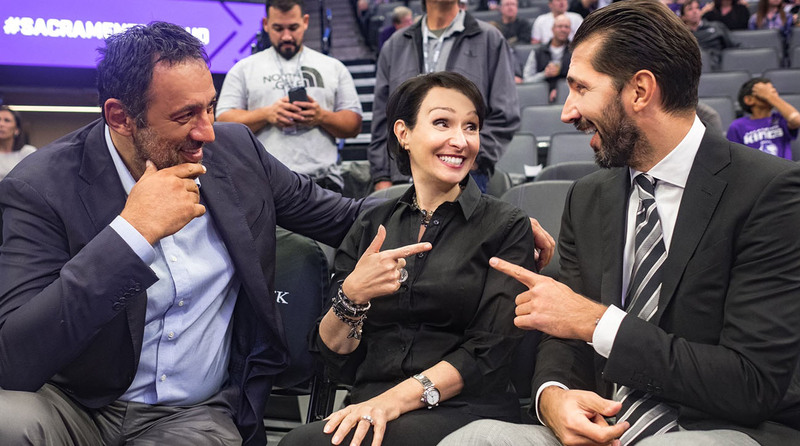 Spending over two decades with the Kings, she is the only woman in the NBA to hold the titles of both COO and President of Business Operations. Ahead of Mother’s Day, she is sharing her story as a female executive in a predominantly male environment to bring attention to the progress women have made in the sports industry and the steps all of us can take to drive change. I was pregnant with my third child and working as a lawyer in Sacramento in 1996 when I received a phone call from Geoff Petrie, then the general manager of the Sacramento Kings. My law firm at the time, Miller, Owen & Trost, had done some work for the Kings. “I understand you know how to read and write Greek,” Geoff said. “Could you help us negotiate the contract for a player in the Greek league we've drafted?" At the time, and sadly even now, women rarely got a chance to break into heavily male-dominated industries. Two decades ago, it was very rare to see female leadership within NBA teams. But I was lucky—I had incredible mentors who showed me how to balance a career with family. And that I should jump at every opportunity. Today, with the #MeToo movement revolutionizing how women are viewed and treated in society, there is an even greater opportunity for women to break down barriers in a way I never dreamed could happen. #MeToo is not just a platform; it is real, meaningful, societal change. And with that change comes a responsibility to share our stories. It is time to draw attention to the challenges we face daily, incite the changes that we want to see, celebrate each other’s success, and, in doing so, blaze a path for the next generation. For me, the importance of seizing opportunities was instilled in me by Nancy Miller, a partner at the law firm that hired me shortly after law school. Nancy always said that whatever your dream is, if you’re fearless, set goals, and take risks, you can achieve it. She walked the walk too; while building a lauded career, she attended parent-teacher conferences and cheered her kids on at their water polo games, while also remaining deeply engaged in the Sacramento community. As Nancy demonstrated for me, the challenges we face as women not only strengthen our own ability to lead—they inspire those around us. That's why I feel it’s important for me to mentor younger women at the Kings; if you watch other women make it all work, then you know you can too. Nancy’s mentorship helped me realize that I could have a fulfilling career and raise a loving family. That’s how I knew right away that I wanted to join the Kings. In my 21 seasons with the Kings, I’ve worked on a range of projects, from strengthening our relationship with the community through the Sacramento Kings Foundation to building the world’s most technological and sustainable arena and bringing more business to the city I call home. At the same time, my husband and I raised three amazing children and remain highly involved in the Greek-American community. Admittedly, I found navigating a sports organization to be challenging at times. As a woman and mother working in a predominantly male industry I faced issues that my male colleagues didn’t. On more than one occasion, a meeting would start with someone asking, “what are you doing here.” When I was starting out, some people assumed that I wasn’t qualified to work in the sports industry because I was a woman. I had to be more prepared than my male colleagues at every meeting and interaction to prove myself. In my early days with the Kings, I credit NBA Commissioner Emeritus David J. Stern, and current Commissioner Adam Silver, with setting the tone at the highest level, for having the vision to be inclusive, and welcoming me when I was the only woman in the room. Under their leadership, the NBA has made progress in promoting, supporting, and developing women leaders. Kings Owner and Chairman Vivek Ranadivé has brought the NBA’s vision to new heights as he challenges our franchise to use sport as an agent of change to break down barriers, build up our community, and create a culture of inclusion in our offices and beyond. At the Kings, we’ve put in place strong family policies to ensure new parents have an easier time coming back to work and staying here for the long-term. We also put a focus on hiring and mentoring women leaders and are one of the only teams in the NBA to have had two female coaches. And I was thrilled to see that Becky Hammon is interviewing for the head coaching position at the Milwaukee Bucks. It’s about time – she’s put in the work and should be given the opportunity. But while we are taking concrete steps, we cannot be complacent with progress and must continue advocating for women and mothers in the workforce. This means putting an emphasis on mentorship and pipeline programs, implementing family policies that support working parents, supporting women in leadership roles so that women know what’s possible, and building a culture that is inclusive. We need to show young women that you don’t have to sacrifice a family for professional success. Twenty years later, I sure am glad I said yes when Geoff called. Thanks to the NBA, I’ve had the chance to pave a path forward for fellow women, just like Nancy did for me. This Mother’s Day, I am proud to be the only female in the NBA to have held the title of both COO and President of Business Operations. Yet, while the number of women in leadership roles with teams have steadily increased, we still have a long way to go—for example women now make up nearly 25 percent of vice president positions in the NBA. As we forge ahead, mentoring women, creating new policies, and dedicating ourselves to an inclusive and fair workplace, I believe our best days are ahead of us.